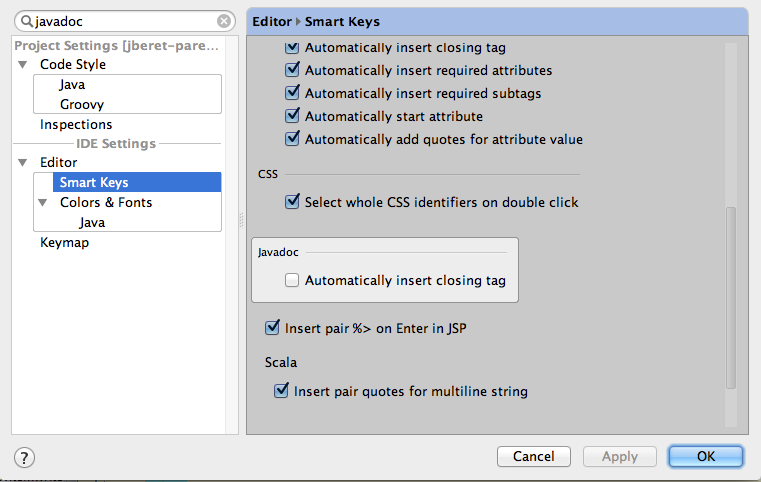 When writing javadocs, IntelliJ automatically adds a closing tag for html elements. For instance, after typing <lt>, it automaticaly adds </lt>, or after typing <p>, it adds </p>. It can be annoying since simple html elements like those used in javadocs don't really need ending tags. 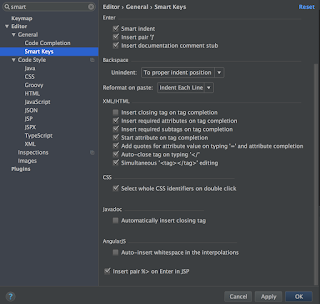 To disable javadoc automatic closing tags in IntelliJ, simply go to IntelliJ Preferences -> Editor -> Smart Keys, then on the right panel, uncheck Automatically insert closing tag. A related note, JDK 8 has tightened javadoc syntax check, and as a result self-closing elements like <p/>, or <br/> are deemed invalid and will cause failures. See JDK-8020619. 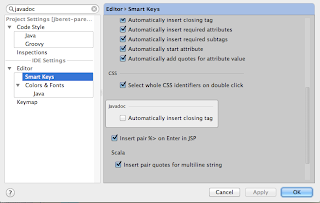 However, this checking can be disabled by passing nonstandard option -Xdoclint:none to javadoc tool. For official javadoc guidelines, see How to Write Doc Comments for the Javadoc Tool . twdiff (/usr/local/bin/twdiff): command line tool of TextWrangler, and launches 3 separate TextWrangler windows (left, right and bottom) for diff and merge. java.util.Properties class (see Java SE 7 Javadoc) by default assumes ISO 8859-1 character encoding in reading and writing. So when a properties file is in other character encoding, you will see strange characters and behaviors. Do I need to trim whitespaces from a property value loaded from a properties file? Do I need to check null when operating on a property value loaded from a properties file? Yes. If a property does not exit in the properties file, then calling props.getProperty(key) will return null. Do I need to check isEmpty when operating on a property value loaded from a properties file? Yes. If only the key exits in the properties file without assigning any value, then calling props.getProperty(key) will return an empty string. 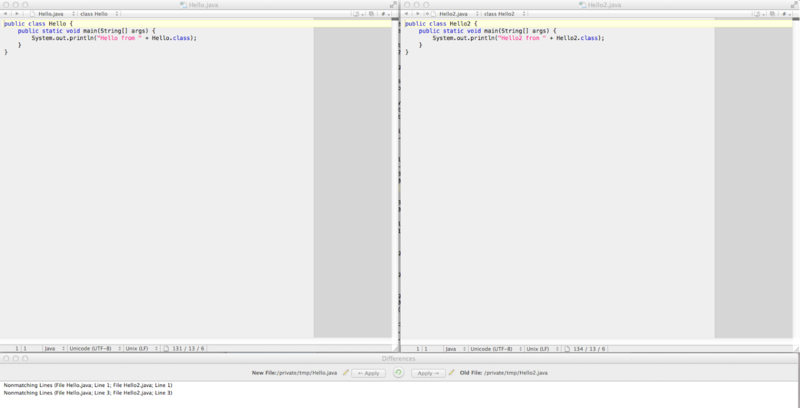 If the value line contains only multiple whitespaces, they will be trimmed away and its value is still empty string. Do I need to escape = or : characters in property file? No need to escape = or : in property value, but if the = or : is part of the property key, then you need to escape them. 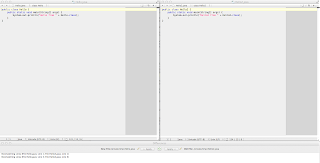 Java treats the first occurrence of = or : or whitespace as the key-value delimiter. So after the delimiter is identified, any use of them no longer needs escaping. 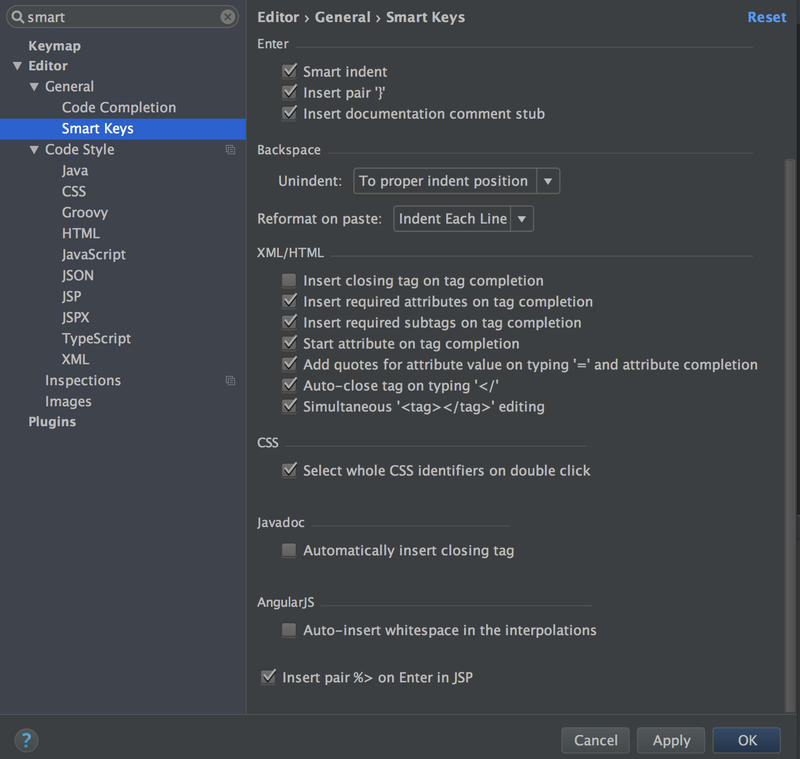 For complete description, see java.util.Properties javadoc.